That my friend, is a genuine Tomato worm, bane of my mother's existence. oh ickkk, should i squish it now then lol i think its long gone, my baby kitty itsy was fussing with it and i think she had a snack. she is hilarious when it comes to bugs, eats them faster than i can squish them lol thanks for letting me know. 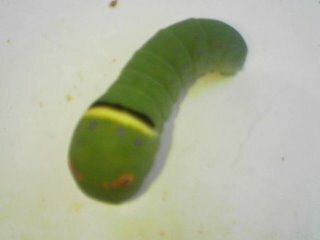 Its a catapillar so if it lived it will turn into some kind of Butterfly. We get similar types here but i don't know what species you guys have lol! Yup, it's a tiger swallowtail butterfly larva. They are a beautiful butterfly.